Please let me know by end of day Tuesday, July 30th if you will be attending the Aug WiN meeting. 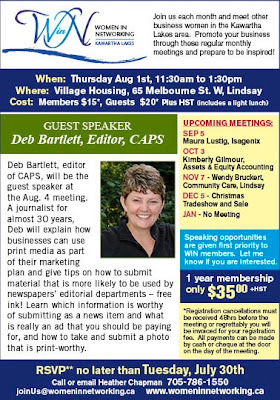 Deb Bartlett, editor of CAPS, will be our guest speaker. Full details attached. Thanks to those who have already replied. Hello Ladies and happy Summer!! Just a quick reminder that our July WiN meeting is this Thursday. 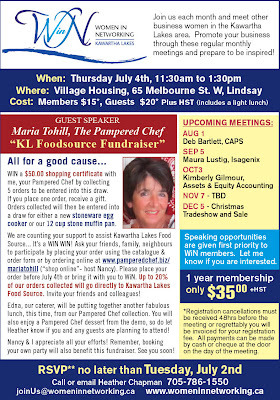 Maria Tohill of The Pampered Chef will be our guest speaker and we will be doing a fundraiser for the Kawartha Lakes Foodsource! Visit http://www.pamperedchef.biz/mariatohill and click on "shop online" for host "Nancy Newton". Please let me know if you (and a guest(s)) will be attending.